Volatility Control is an approach to investing that deploys capital according to risk exposures rather than fixed market exposures. It de-gears or reduces exposure as volatility rises. Read more about volatility control here, some commonly asked questions about volatility control are answered here. One beneficial feature of using volatility control as an investment approach is that options to protect against falls in a volatility controlled portfolio are much cheaper than those which protect against portfolios allocated on a fixed market exposure basis. The volatility of a fixed amount of equities varies very substantially through time (see below), indeed this is the motivation for employing a volatility control approach in the first place. The above chart illustrates the volatility of the FTSE 100 index, using an exponentially weighted volatility measure with a half-life of 50 days (click here for an explanation of why this is a good measure). It’s clear that volatility varies substantially both above, and below the long term average of about 17%. When we go to a investment bank to buy an option to protect against falls in a portfolio of FTSE 100 index stocks, it it these large spikes in volatility that will determine the price: the price maker will be afraid that should another spike occur (and inevitably it will at some point) the payout on the option contract could be large, therefore the premium charged for the option must compensate for this. How does volatility control help ? Volatility control irons out these peaks in volatility by employing a mechanism that manages risk by de-gearing or reducing the exposure to equities as volatility rises. This means that when volatility is high, exposure will actually be very low. This means options that protect against the fall in value of a portfolio will be substantially cheaper, as the seller of the option need no longer fear a volatility spike. The difference can be quite material, as illustrated below. 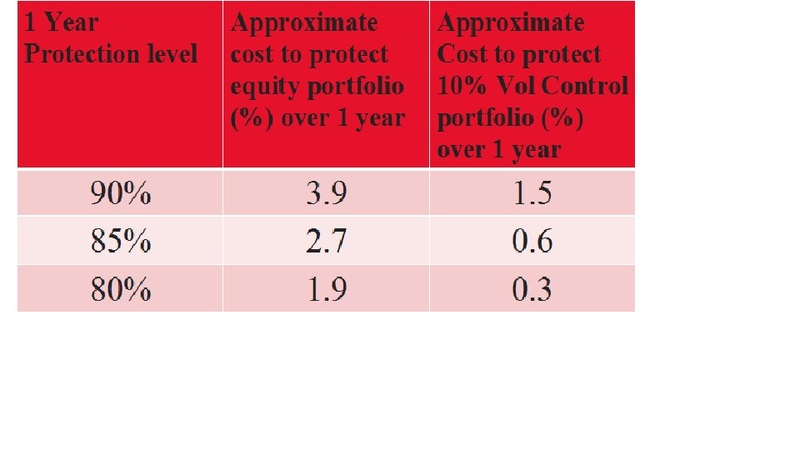 The result is that for a cost of around 60 basis points a year we can effectively put a floor on portfolio losses in any given calendar year of 15%. To do this on a fixed market allocation of equities would cost over four times as much.